"Plan the Play " by Dave Huggett and Stephen Cashmore demonstrates 60 single dummy problems, designed for experienced but not expert players. This book aims to familiarize players with card combinations likely to occur at the table and shows how they can be solved using logic. "Victor Mollo's Bridge Club - how to turn masterful plays into monstrous points" examines the techniques and tactics of bridge by inspecting the playing methods and actions of such character types as Papa the Greek, The Hog, and Rueful Rabbit that are to be found in Victor's Bridge in the Menagerie series. The unique problems and complexities that arise from playing as part of a team are a challenge for anyone interested in competitive bridge. Julian Pottage, one of the UK's top bridge players and writers, provides expert advice on the difficulties faced by the team player; such as tackling bidding decisions, card play problems and tactical strategies. Packed with clear and detailed explanations throughout, "Win the Big Match" guides you through a fictional 64 hand bridge contest, pointing out what to do and what not to do in order to win that big game. The step-by-step examples enable you to develop the tactical strategies that are essential to team play and guarantee you sucess at competitive teams bridge. Do you ever wonder why some defenders seem to be able to read each other's minds? Why they are so sucessful at anticipating the other's intentions, avoiding all pitfalls and traps, and seem to win every time? The answer is that they are not usually guessing - by learning defensive signals it is possible for even novice players to drastically improve their game. Defence is the most difficult partnof bridge, but it can be made easier by using signals to help partner along the way to success. In "Easy Guide to Defensive Signals at Bridge" Julian Pottage enables readers to use, recognise and understand all the standard defensive signals used in bridge and to gain an awareness of alternative methods. In "Play with the Champions" you pit your wits against the experts in 36 exciting and fascinating hands from championship play, with commentary from Ron Klinger. The most popular in any Bridge magazine is probably the 'bidding panel' article. In "It's Your Call" Brian Senior has gathered some of the best for this best for this book. Entertaining and instructional. In "Inferences at Bridge", Marshall Miles addresses the complex area of inferences for the more advanced player. A good bridge player must look for those vital clues in the auction or play that will lead him to draw the right inferences and make the best bids or plays. This book shows how to do this, and describes many common situations where inferences are typically missed by less advanced players. 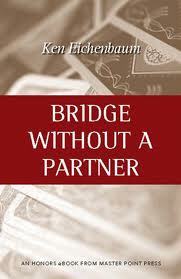 "Bridge Without a Partner", by Ken Eichenbaum, is an hysterical book, covering a large number of deals that you will be hard-pressed to believe were real, but they did happen in real play. The deals are analyzed by an extremely gifted semi-pro who actually played most of these hands with clients. Most bridge players find squeeze play one of the hardest techniques to learn. It has many unavoidable technical points that for many make it impenetrable. In this award-winning book "A Bridge to Simple Squeezes", Julian Laderman takes the reader slowly and carefully through the basics, and then by the end you will be confident that you too can execute simple squeezes at the table. This 2nd edition reflects many enhancements and improvements to the original version, which was the 2006 American bridge Teachers Association Book of the Year. "The Encyclopedia of Card Play Techniques at Bridge " by Guy Levé is unique in the literature of the game. This book describes and classifies hundreds of tactics, stretagems and coups used during the play of the hand. Each technique is illustrated with an example deal, and its application fully explained. The topics run from the simplest finesses to the most complex squeeze positions, and cover literally everything in between. This book will be an essential component of any bridge library. In "The Elusive Masterpoint" Carl Vancelette recalls his life in bridge and his attempts to acheive competence, acheive Life Mastership, and simply stop making the same errors over and over again. He'll make you laugh and teach you some fundamental lessons. "Improve Your Bidding and Play" by Derek Rimington and Ron Klinger is in question and answer format; a terrific guide that will improve your game. The solutions are all logical and by working through the hands with the experts at your shoulder you understand the clues that lead to winning decisions. Beginners at bridge are taught rigid rules to apply to bidding, rules that involve point count, losing trick count and other evaluation methods. But they quickly discover that there are more situations where the rules don't apply than where they do. In "Improve your Bidding Judgement" Neil Kimelman addresses a gap in bridge literature by discussing how to make decisions in the auction: when to be aggressive and when to pull back, when to take saves, when to double the opponents, and so forth. Filled with real-life examples, practical advice and helpful quizzes, this will help any reader become a better bidder. "Kelsey on Squeeze Play" is a complete compilation of Hugh Kelsey's four outstanding books on squeeze play in the Kelsey on Squeeze play series: - ' Simple Squeezes ', ' Strip-Squeezes ', ' Double Squeezes ' and ' Triple Squeezes '. Each title is complete in itself and by the time the fourth book has been mastered, a formidable amount of knowledge will have been acquired. The ability to execute an effective squeeze play lifts a player's game to an exciting new level. All ambitious players need to read this book, so take advantage of all four volumes now being available in one book. B1, B2, B3, B4, B5, B6, B7, B8, 1, 2, 3, 4, 5, 6, 7, 8, 9, 10, 11, 12, 13, 14, 15, 16, 17, 18, 19, 20, 21, 22, 23, 24, 25, 26, 27, 28, 29, 30, 31, 32, 33, 34, 35, 36, 37, 38, 39, 40, 41, 42, 43, 44, 45, 46, 47, 48, 49, 50, 51, 52, 53, 54, 55, 89, 98, 99.